More Than Just Corn: Day 13 - Do You Believe In Fairy Tales? Day 13 - Do You Believe In Fairy Tales? So I thought this comic was pretty funny, since those of us in the blogging world can probably relate to this pondering when we are having a bit of writer's block. What on earth is Mother Goose doing here, right? Well of course I went outside with my camera in hand. It just looked up at me as if to say, What? You thought I was just in fairy tales? And I'm all like, Um, Yeah so where's your apron and hat? And shall I wake Olivia so you can read your book to her in person? Perhaps she can fly around on your back? So after I followed her around a bit, (she was as tall as my shoulders!) I snapped some photos and tried to get her attention again by making silly noises with my mouth. She comes over to me, and leans in to whisper a little something in my ear with a bit of an attitude. You stupid humans, she says. Look at how big and regal I am. Look at the beautiful black feathers around my eyes and the way that my neck curves so elegantly. Do you really think a GOOSE of all creatures, would look as lovely and as big as me? Mother Goose and I have nothing in common. Then she informs me that She is a He. And that if I want to be a proper mother to my own kids, then I really need to brush up on my Fairy Tales, and read the story about *The Ugly Duckling. I blushed. He's right, I'm not as current with my Children's Tales as I should be. Dora the Explorer, Elmo, and Wheels On The Bus usually trump whatever suggestions I might give for reading material. 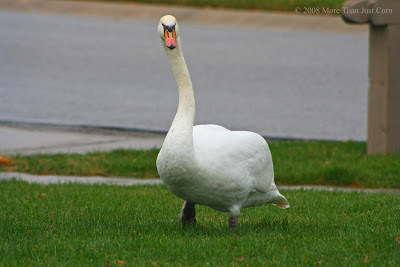 So, next time I just happen to see a 4 foot tall white bird walking across my lawn, I will do my best not to insult it by calling it a goose. ....But I must say, whatever story He came from, it was nice to see that sometimes, Fairy Tales do come true! 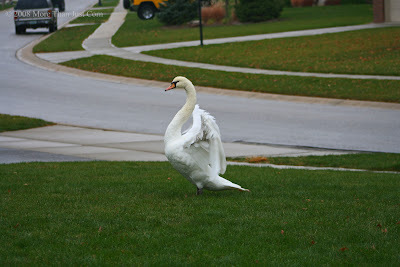 *I'm a Swan, not a Goose and Animal Control was called to come rescue me and my broken wing. No animals were harmed during the making of this blog post. Wow! Glad to here he was rescued. He is beautiful! Great story! I'll vouch for you. Sesame Street was your favorite and of course along with ZOOM. That was awesome - I must admit when I read you said Goose I was puzzled! 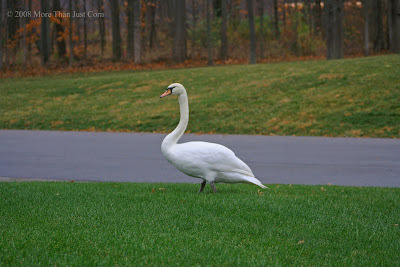 What a beautiful Swan and I loved your disclaimer at the bottom of the post!!!! Glad all went well and it was rescued! Day 30 - What Gets You Moving? Day 20 - Writer's Block? Day 18 - The Next American Idol? Day 6 - Where Did November Come From? Day 1 - Heads or Tails?